There is nothing like a resolution or a goal to make the universe sit up, take notice, and decide you are worth the effort to knock down. 2017 and I are off to a typical start. What is typical you ask? Well I wrap up my traditional Holiday Season, which starts at Thanksgiving for me and ends a few days after New Years- yep it is a long break- however, my summers way down here in zone 9a Texas are only slightly cooler than say... “hell” so, my down time is when I can go outside and enjoy it, namely Winter. After my Holiday I get down to serious, dig deep, thinking about the New Year. What worked, what didn’t, and what would I like to see in 2017? Well, quite a bit as it turns out and I will share some of my thoughts on another post, suffice it to say- man plans God laughs. This morning was scheduled as my day to take photos of my Vintage Capsule Wardrobe blouse from the December Blouse Challenge and I was excited to be about it. That is when my day (well really this project) starting resembling a Series of Unfortunate Events. 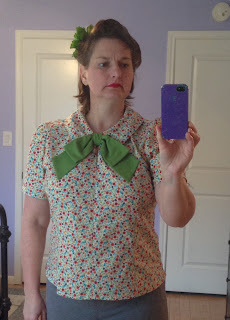 First up this is a Vintage blouse from a re-released Simplicity pattern. This pattern to be exact. It is super simple and will make a great basic to go with 1940s style wide leg denim pants which is the plan. But nooooooo I do not actually have a copy of this pattern, because I have already made it up for a young lady and have neglected to purchase another copy for myself. No worries, patterns go on sale all the time- except they didn’t in December- at least not Simplicity. Awesome. I’m not gonna lie, I pouted about it and set the fabric on the shelf and went back to making cookies. After Christmas with still no Simplicity sale on the horizon I needed to get serious, I was going to finish this blouse before New Year! So after rummaging around in my bins I decided on the “Monster Blouse.” It is super cute, easy to do and is still a Vintage feel although 60’s instead of 40’s. I got going and got it done….except it is sleeveless. Now Y’all… (see I can do that because I live in TX) I don’t do sleeveless. I am currently not speaking to my upper arms and so the less I see of them the better. So I drafted a quickie puff sleeve, which worked out great because it will sorta allow me to lean back to the 40’s which is where I’d rather be anyway. So here it is in all it’s DONE glory. I did actually complete it before NewYear…taking pictures is another story. Actual pattern used Simplicity 2154 with puff sleeve added. *Tip of the day! Notice my zipper zips down instead of up? That is intentional, I first got the idea from a very nice off the rack linen summer blouse I own which has the zipper installed this way. It was like a lightbulb! This is SO much easier to zip into and out of. This little vintage pearl button? Yeah it broke off the shank this morning before photos...can we say new button installation time lag? Recently some much more photo savvy friends of mine clued me into a super cool device that allows me to link my Nikon to my phone and see what the camera sees, snap a photo using the phone as a clicker, and upload said photo to my camera. Whaaaaaa?!?! This could change everything! I ran right over to Amazon and bought me one. It came in the mail and it looked so classy and techy! I downloaded the WMU app from Nikon, plugged in the little adapter linked them in my wifi settings and I was off to the races! The snail races….ok this thing is the best idea EVER, but typically in practice it is just not getting it done. I fussed around with this thing for a solid hour (folks I have other things I need to do in a day- an hour is a valuable piece of real estate in my world.) it does work- but it is slow like - there - is - odd - lag - slow. Then I still have the problem of not knowing what to do with my hand which is holding a phone and where do I look? I need to look at the phone to position then the camera to act natural (yeaaaaahhhh that’s gonna happen.) It could have been cool, it could have been the device that made my blogging YEAR! Maybe it still will be but there is a total learning curve here. Then the kicker…it does upload the photos to your phone (slowly) but then they are on your camera not your phone- do you see where I am going here? So now you still have to transfer photos from your camera to your computer and edit and I can feel my life slipping away just thinking about it. Selfies...meh. But hey, the blouse is cute! So it is obvious to me that my big huge blog aspirations, goals, and so help me decisions are going to be uphill (at least for a little while.) You see, I know that it will get easier as I flex muscles I have allowed to become lazy. It will get easier as I reacquaint myself with tech tools and habits that otherwise lay dormant. Until that glorious day when blog advice like “Write when the mood strikes you, bang out several posts when you have high energy to save for a rainy day.” stops making me snort with derision because every single task is taking forever. For ever. I have a pretty blouse and the fact is I can actually sew faster than I can blog- so take that Universe! See ya again real soon. Are you determined in 2017? What goals have you most fired up to sew? This Edwardian suit is happening! Oh. My. Gosh! BEST POST EVER!!! I laughed out loud which drew several odd looks from the boys. Oh you my friend are delightful! So funny!! All of it! Especially the working on getting the camera do-hickey to work. I LOVE LOVE LOVE your blouse! It is so sweet and you are right, the sleeves totally put it back about 20 years! Huzzah! The color and print of the fabric is super sweet too and LOVE your hair!! Can't wait to see the Edwardian suit!!! Blessings to you my seriously hilarious friend! I know right? By the time I actually got to the writing I was in high attitude! Thank you my friend for all your constant encouragement and support. A week later I am noticing I need to edit in the actual pattern image because it is a cutie and fun to make. Man- my blog muscles are flabby! Love the blouse. I need to make some. I have some nice linens to use. As far as goals for this year, I need to finish two dresses - one is mine and the other is for a friend. We'll see what happens after I finish them. Finished dresses are a beautiful thing! I love waiting all of your hand sewing projects come together Geri.